Creative Beasts » Surviving the Holidays: Creative Tips For the Service Industry. Home > creative process, film, inspiration, just for laughs, meditation, music	> Surviving the Holidays: Creative Tips For the Service Industry. Ah Ha! The Burgermeister technique is very good advice. 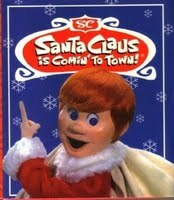 I think that animated Chris Kringle looks like a clean shaven Brett Farve in a Redskins uniform. Ah yes, the holidays. Good will toward men indeed. It seems only if that man is behind you in line. If they are leaving their parking spot just as you arrive. If they get the second to last of whatever it is your shopping for. If they get up from the bar just as your arriving. If they give you a local disount without asking. If they recognize you from somewhere and treat you unusually nice. And maybe give you their front row concert seat stubs. Otherwise, it seems like all bets are off. Christmas is not a big deal in Hawaii. None of the Maui municipalities put up any decorations. No Corona commercial lit up palm trees. Kaanapalli resort puts up a Santa being pulled by eight + 1 tiny dolphins; but that’s pretty much it. Halloween is the biggest holiday on the island. Brett Favre… I didn’t think of that. You’re right; he does look a little like him. Funny! …I still love those old stop-animation Christmas films, cheesy and dated as they are. I think Heat Miser is my favorite character (from Year Without a Santa Claus). …Yeah, the whole “Good Will Toward Men”-thing… That’s my biggest bone to pick this time of year, and you just get a very good picture of it (though not necessarily a pretty one) working in the service industry. If people would just try to remember a little bit about why they’re out shopping in the first place, some of them might be a little kinder and gentler. It all gets muddied by notions of greed and competition, among other things. Some people might not enjoy getting gifts for others at all–they only do it out of feelings of obligation… On a separate note, where I work, we ask customers if they would like to give a contribution to St Jude’s Children’s Hospital, which is famous for its oncology research. You know… to help fight childhood cancer. Customers can round up their purchase to the nearest dollar. Frankly, I find it almost astonishing just how many people don’t rise to the occasion. Add a dollar to your purchase. Fifty cents, even. And while many people do give–and that’s wonderful, there are so many who don’t for whatever reason. Often, people will give a reason as to why they won’t contribute, oddly. It’s not as though we ask for an explanation. But I can’t help thinking sometimes, “Gee. Maybe you could skip your second trip to Starbucks today, and give a little something instead.” But I guess that’s being unfair and judgmental and lacking in holiday spirit, right? Regarding HI: I think I would miss seeing decorations; especially the lights at X-mas… 🙁 I bet fir trees cost a fortune there, too. *sigh* Do you put up lights? …I think I would. Go Crazy for Your Dreams. It’s All You, Baby. Keep Moving. The World Won’t Stop.